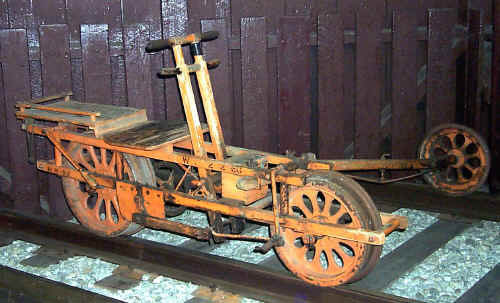 The SBHRS three-wheeled velocipede is a unique piece of railroad maintenance-of-way equipment. A track inspector rode and propelled this vehicle down the tracks by alternatively pulling and pushing the dual wooden handles. The worker carried all his necessary tools for track and tie maintenance on the vehicle. Due to weight considerations in getting this vehicle on and off the tracks by one person, everything on it is made of wood, except for the wheel rims. The age and early assignments of this particular velocipede are not known. In later years, it was used on the SP’s Los Altos Branch for a brief period in 1949 and was regularly used on the Colma Branch in the 1950′s and early 1960′s. Elmer Stone, a general Foreman with the SP Coast Division maintenance-of-way gang, stated he “rescued” this vehicle from a storage shed in South San Francisco in 1968. He placed this item on permanent loan to the SBHRS Museum in 1991. At his request, this vehicle has not been restored and, therefore, shows significant wear. However, this does not detract from the uniqueness of the vehicle.